to your music, whatever style you are looking for. Interactive keyboard display makes navigating the A-List Guitarist sounds a breeze. Grit control: adds a gritty, high-mid boost to the guitar signal on Pop Chords A-list Electric Guitarist. Raw output: great if you want to use your own amp. Improved chord recognition with two-note intervals: Play C and D simultaneously for a sus2 chord. More content: 24 new styles and 32 new patches. Add studio grade rhythm guitar to your music! 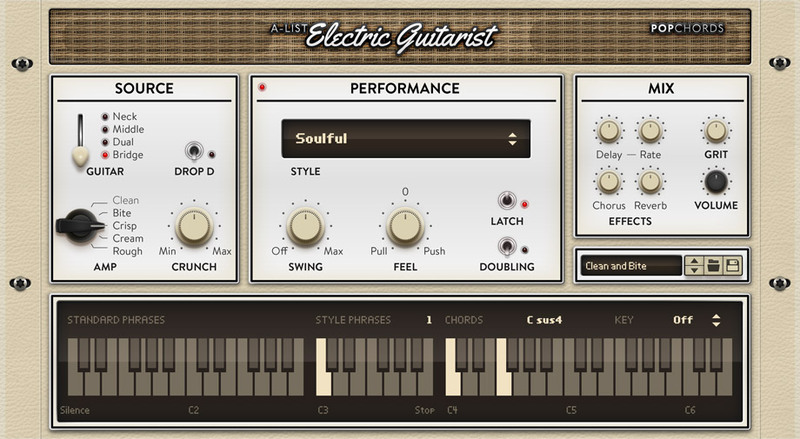 A-list Electric Guitarist Pop Chords combines the creative freedom of working with a top-notch performer with the accessibility and ease of use of using audio loops. Play chord progressions and select your rhythms from your MIDI keyboard – it’s both easy and inspiring to use. As flexible as the real thing and as easy as simply dropping an audio loop into your track, A-list Electric Guitarist Pop Chords is like having a live guitar player with all the needed gear, always available at your fingertips. With jaw-dropping quality and a natural sound, this Rack Extension will deliver stellar results. A solid rhythm guitar is the harmonic backbone of your song. PopChords comes with over 1300 guitar rhythms that covers more than 110 styles. Select your style and start playing. Switch between rhythms within the style by playing keys on the lower octaves. Explore alternate voicings and sound settings to get just the sound and rhythm you are after. Pop, Rock, Funk and much more. Pop Chords sounds great in any musical setting. To get you started, it comes with more than 80 presets that combines style and sounds settings. What kind of instrument would you like? Select one of the four tones that suits your music. You can set the key of your song and Pop Chords will pick the right chords for you as you play one finger chord progressions. Or leave it off and have all chords and voicings available to you. Add a gritty, high-mid boost to the guitar signal. Select any of the 110 styles to find something that matches your ideas. Each style has 34 phrases that can be selected in real-time from your MIDI keyboard. For each style, there are 11 style-specific phrases and 23 ‘standard’ phrases that are common to all styles. There are over 1300 phrases in total. Clean, Bite, Crisp, Cream or Rough - pick on of the five amp models to shape your guitar sound. Adds crunchy distortion to your sound. Makes navigating the A-List Guitarist sounds a breeze. Sets the amount of swing, or shuffle, in the playing phrase. How do you want Pop Chords to play? Just ahead, just behind or perfectly on the groove? For a bigger stereo sound, activate doubling. Pop Chords comes with a set of built-in effects to help you get the sound you are after. Reverb, Chorus, Echo and Slapback can be applied. Sets the amount of guitar output, from none (rendering the device rather pointless) to full-on rawk. And no, it won’t go to 11. Pop Chords comes with more than 100 patches to help you get going.